Last year, over four billion global passengers boarded an airplane, setting a new record in global aviation. 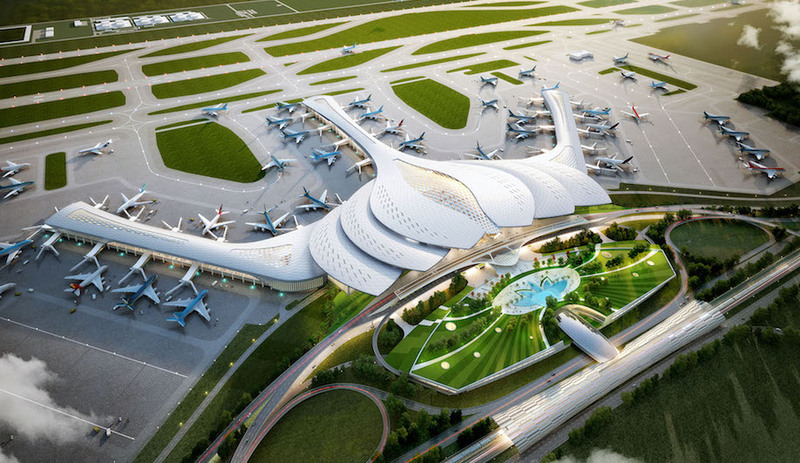 It’s a trend that’s poised to intensify – despite the cost to the environment – with global air travel predicted to double within 20 years, marking an accelerating era of mobility with the airport as its locus. As the economic importance of aviation becomes more pronounced, the value-engineered hubs of the late 20th century are also giving way to bolder aesthetics. A new era of airport design is rekindling the jet-age ambition that made projects like Minoru Yamasaki’s Lambert–St. Louis International Airport and Eero Saarinen’s TWA Flight Centre into mid-century icons. 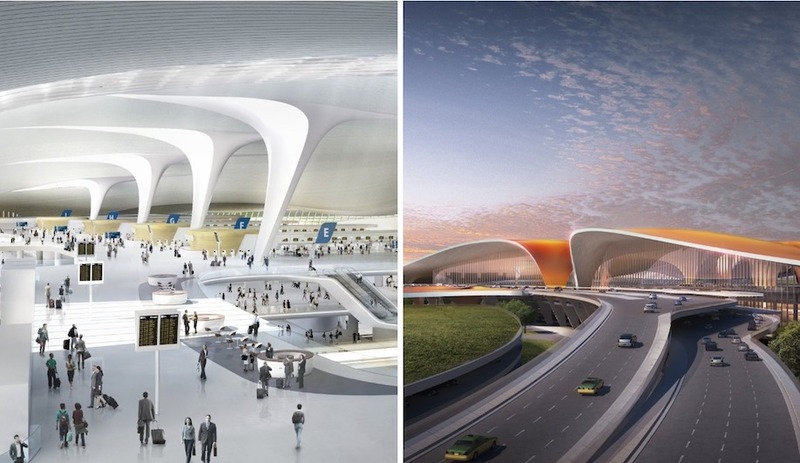 Below, we preview eight new and upcoming airports that reach new architectural heights – and promise to shape the future of transportation. In a lush and fragrant tropical forest, a glazed toroidal dome sits atop a 40-metre-high waterfall. The seven-storey waterfall cascades to visually connect a varied interior landscape of 280 shops and restaurants, as well as substantial public space and greenery – all at the heart of the Jewel Changi airport, designed by Safdie Architects. 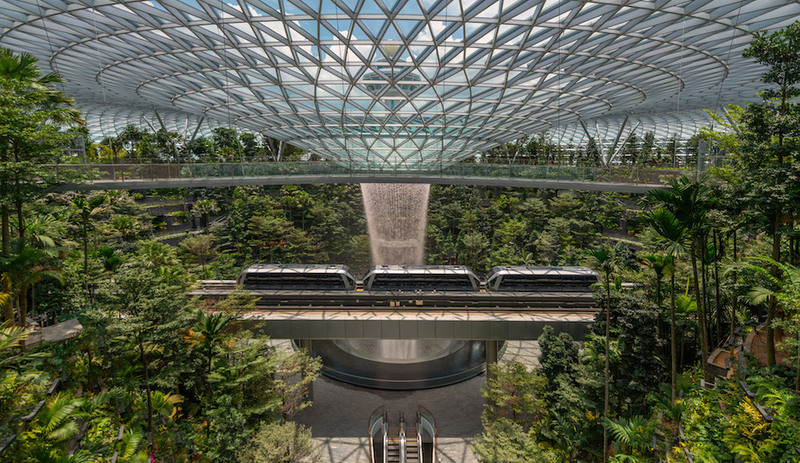 Opening on April 17, the mixed-use Jewel Changi hub brings a new sense of place – and wonder – to aviation and connects the three terminals of Singapore’s largest airport, already rated as the world’s best by Skytrax. 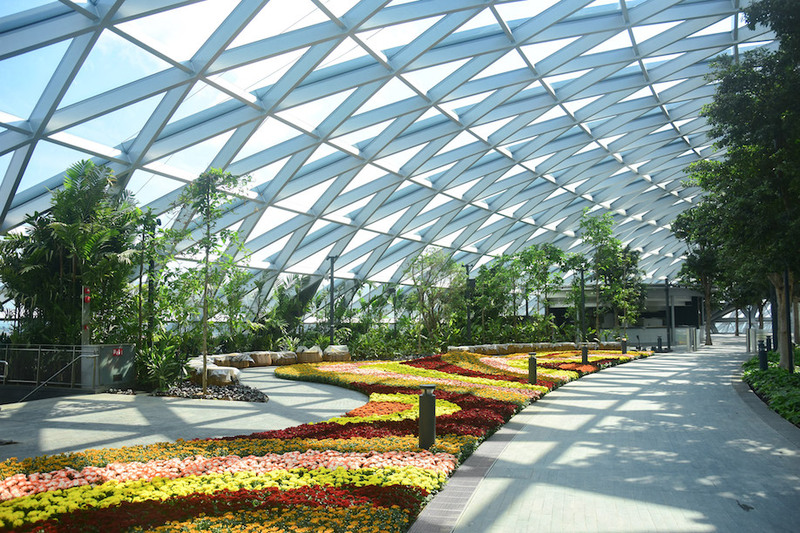 Inviting exploration, recreation and rest, Jewel Changi is strategically positioned for a uniquely enticing presence. Inspiring a sense of whimsy and adventure, it is already a destination in its own right, with crowds of thousands turning out to preview the place. 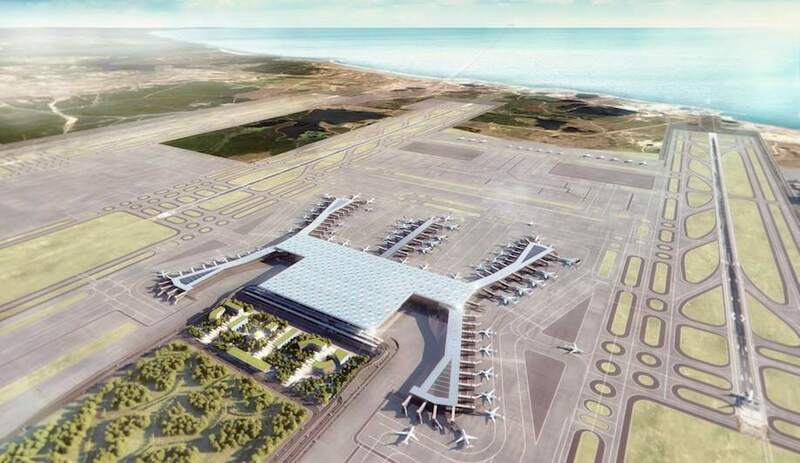 In early April, Turkey’s capital city welcomed the first passengers to the New Istanbul Airport. 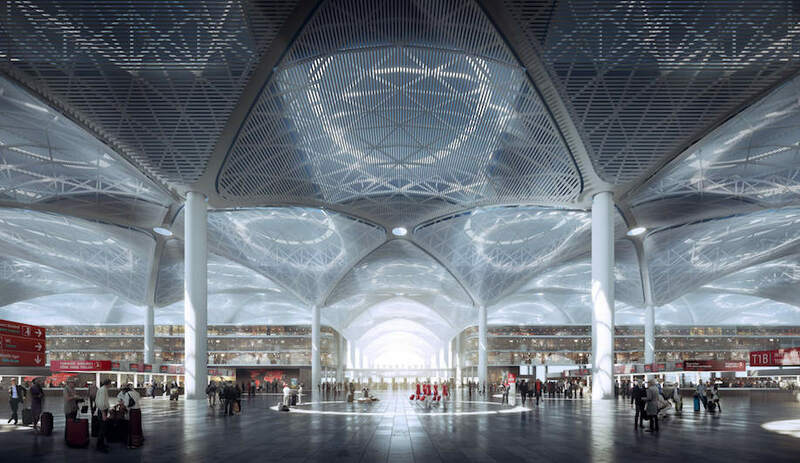 Replacing the staid Atatürk Airport, the facility – designed by Grimshaw Architects in partnership with Nordic Office of Architecture and Haptic – is poised to become the world’s highest-capacity airport once construction wraps up later this year. 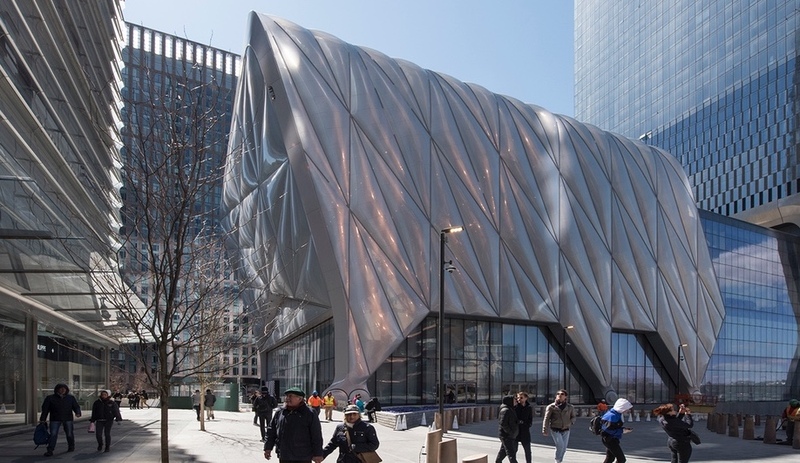 It boasts almost 1.5 million square metres of floor area, and merits making the list for its size alone. New Istanbul Airport parlays this unmatched footprint to create substantial outdoor public space. Fronting the entrance hall, a linear green space greets passengers with a natural landscape. 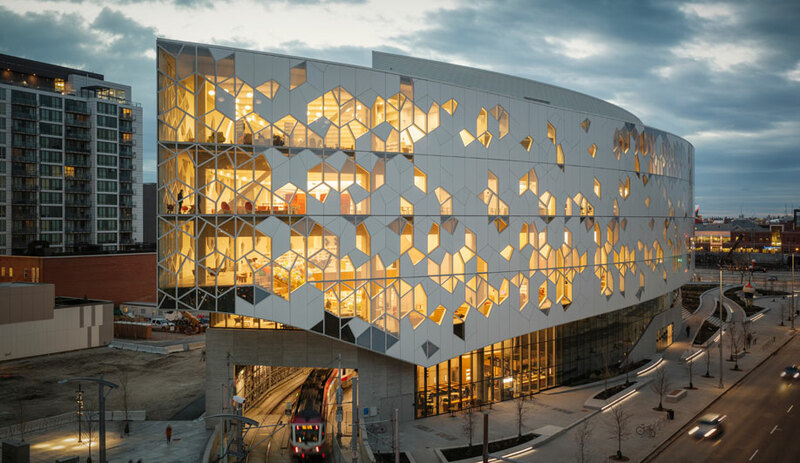 Inside, the design draws on the architectural character of Istanbul’s Byzantine era and evokes a sense of coherence through a repeating pattern of textured vaulted ceilings. Throughout, skylights draw in diffuse daylight to create an open, energized space with clear sight lines. 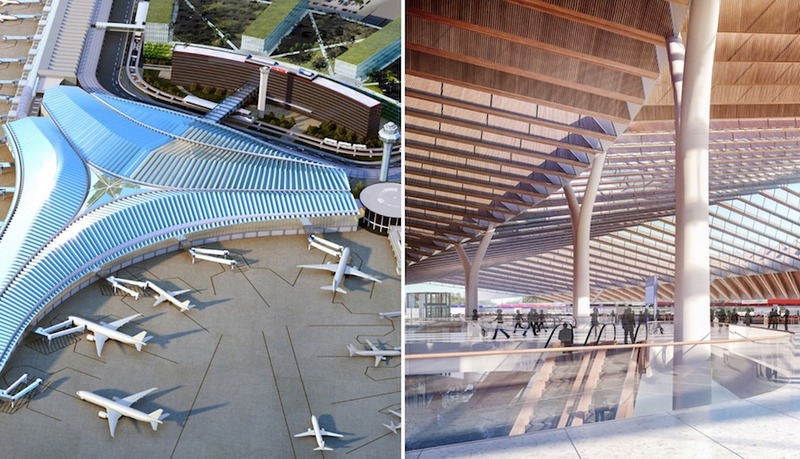 “Every aspect of the design is focused on creating a uniquely Chicago experience,” Jeanne Gang declared upon revealing her vision for O’Hare. A Chicago native, Gang’s firm heads the Studio ORD design consortium that beat out teams led by Foster + Partners, Santiago Calatrava and SOM to land the commission in March. Evoking the contours of Lake Michigan and the Chicago River, the Y-shaped “O’Hare Global Terminal” unfolds from a central oculus that branches out in greenery and wood tones, imbuing the 0.2 million-square-metre space with a surprising sense of comfort and intimacy. A pleated roof of long-span steel trusses inspires a sense of dynamism and movement, while bringing in ample natural light. Gang’s deft combination of texture, pattern and angularity eschews the sanitary and liminal visual language of older airports in favour of a more humane experience. Hinting at the topography of rolling terrain, the slope of the white-ribbed roof quietly delineates the open hallways into more discrete, human-scaled environments. 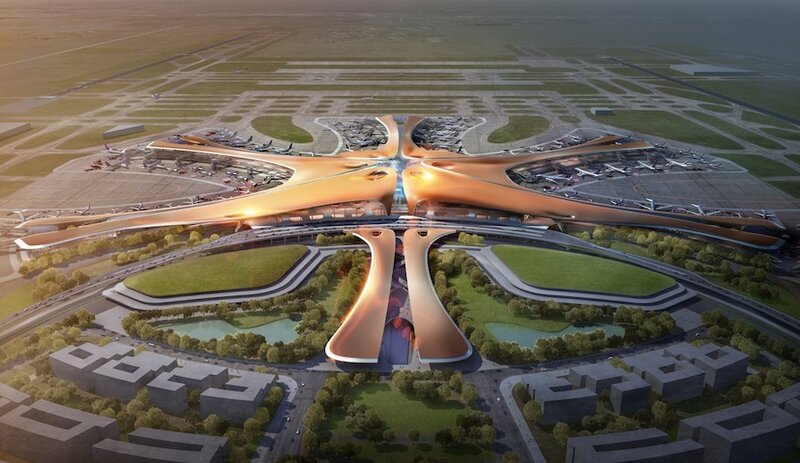 This summer, China’s capital city is expected to welcome passengers to the new Beijing Daxing airport. The six-pier radial form stretches out in a sinuous, flowing structure that bears the late Zaha Hadid’s unmistakable architectural signature. Designed to minimize confusion and long travel distances within the terminal, the 0.7-million-square-metre hub is organized around an amenity-rich central court that nods to the vernacular of traditional Chinese courtyard homes. Natural light and quality of space are top priorities, unified by an impressive aesthetic that conjures a strong sense of place. The soothing organic forms also make Beijing Daxing an eye-catching standout compared to its more angular and rectilinear contemporaries. There are few things New Yorkers can agree on but hating LaGuardia Airport is surely one of them. In a landslide vote, the ageing Queens terminal claimed the inauspicious title of “The Worst Airport in America” in a 2014 Gizmodo poll. 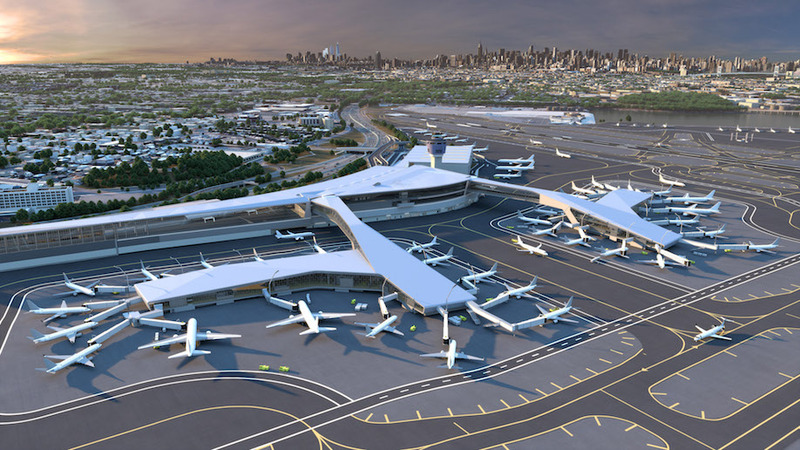 Luckily, LaGuardia’s fortunes are finally turning, with the first stage of the new Terminal B in operation since late 2018. Inside the first phase of Terminal B, which opened in late 2018. Photo via LGA Airport Partners. Opening in stages, HOK’s design is gradually improving the passenger experience with the requisite greenery, natural light and streamlined circulation. Since the airport is not a major global hub, the project understandably lacks the architectural ambition evinced by its contemporaries. Nonetheless, the much-improved terminal takes on greater significance for transforming an airport that has long epitomized the very worst of the passenger experience. Architect Robert A.M. Stern characterized the TWA Flight Center at New York’s John F. Kennedy International Airport as the “Grand Central of the jet age” over half a century ago. In the decades to come, however, the futurist optimism of Eero Saarinen’s design would yield to an era of more rationalized expansions that followed the building’s 2001 closure. 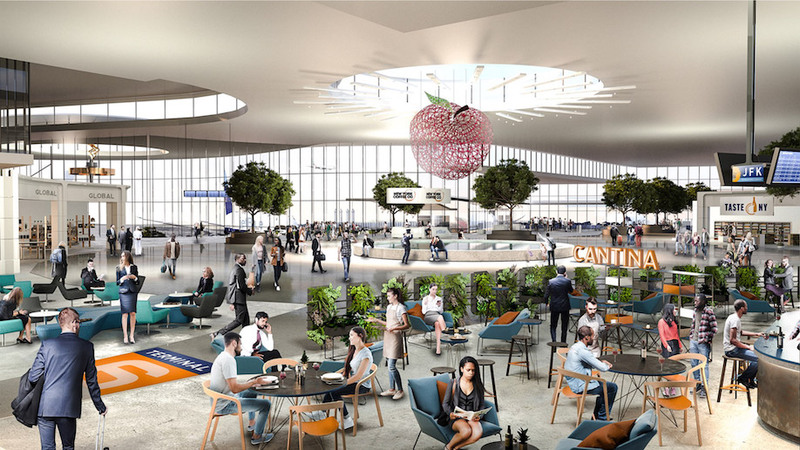 This year, however, the iconic terminal finds new life as a hotel – opening on May 15 – while the surrounding airport gears up for a US$13 billion redevelopment. 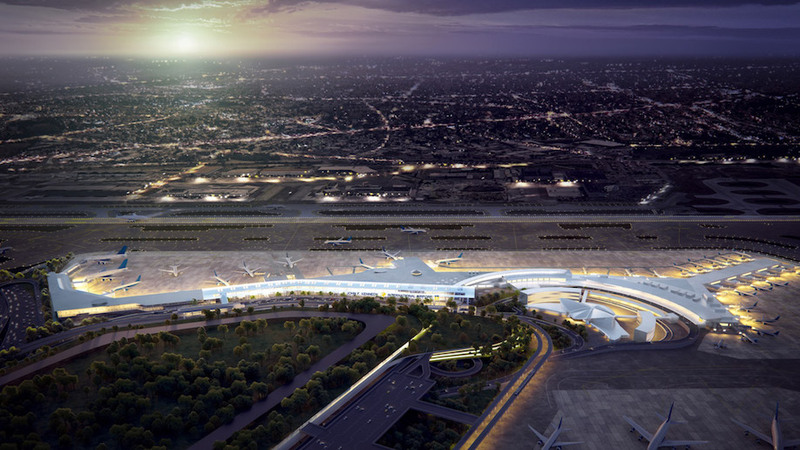 In October, New York Governor Andrew Cuomo announced a rebuild of the airport, which serves as the primary international entry point to the United States. 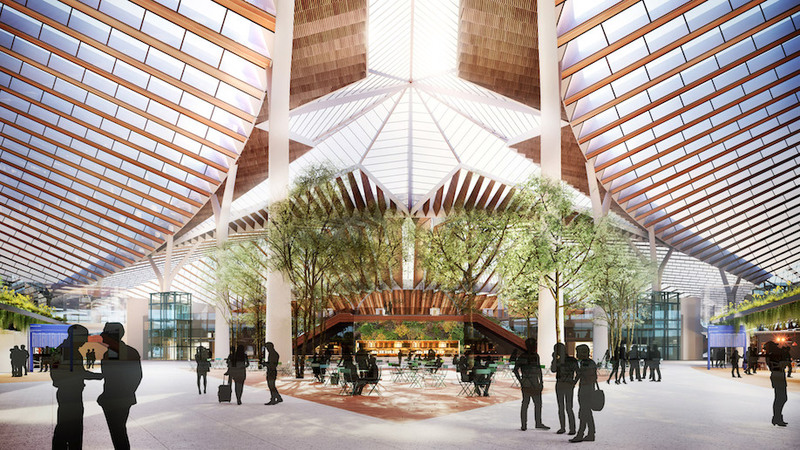 Grimshaw Architects are leading the master plan, which calls for a much-expanded airport with substantial indoor green space, children’s play areas and cultural exhibitions. 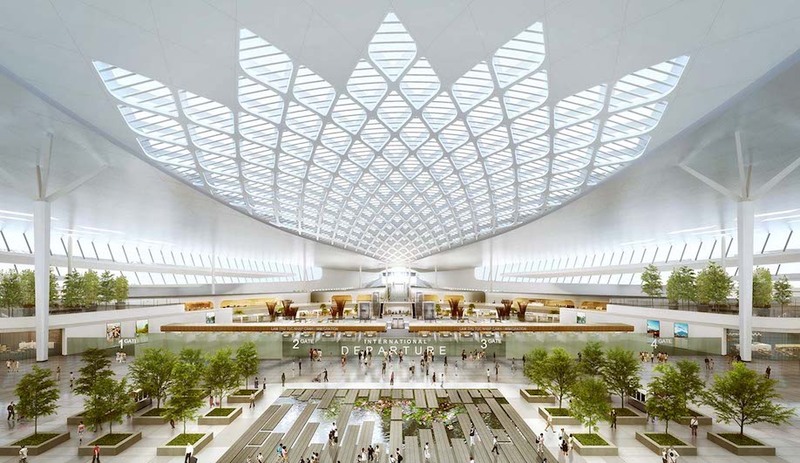 Set to serve Vietnam’s bustling Ho Chi Minh City, the planned Long Thanh International Airport promises to be an architectural icon – especially from above. Representing the country’s national flower, its lotus shape would make the airport a prominent symbol of Vietnam. Inside, that same motif is reinforced in a showpiece skylight, while the curved ceilings lend the sprawling central terminal a kinetic touch. Along with greenery and ample natural light, the interior will serve as a showcase Vietnam’s famed water features. A 2025 opening is targeted. 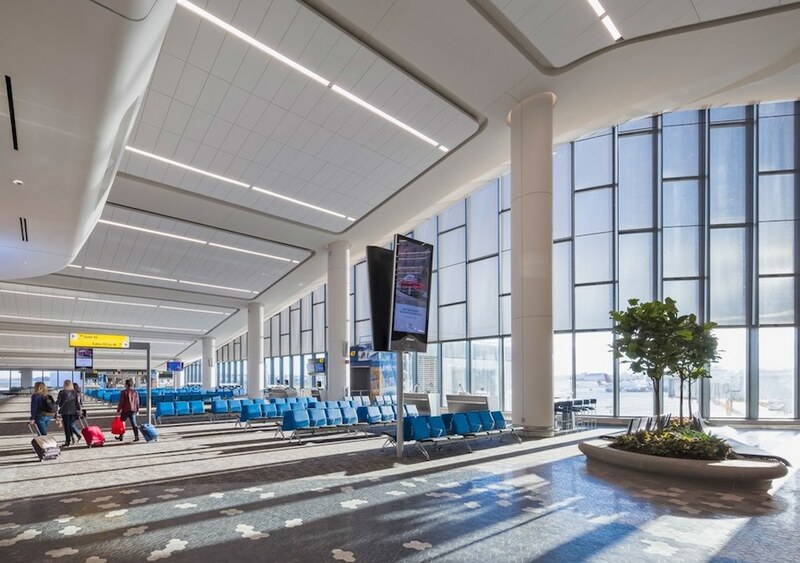 “Other than the runways, there’s nary a straight line to be found at the new Louis Armstrong New Orleans International Airport terminal,” declared the New Orleans Advocate. 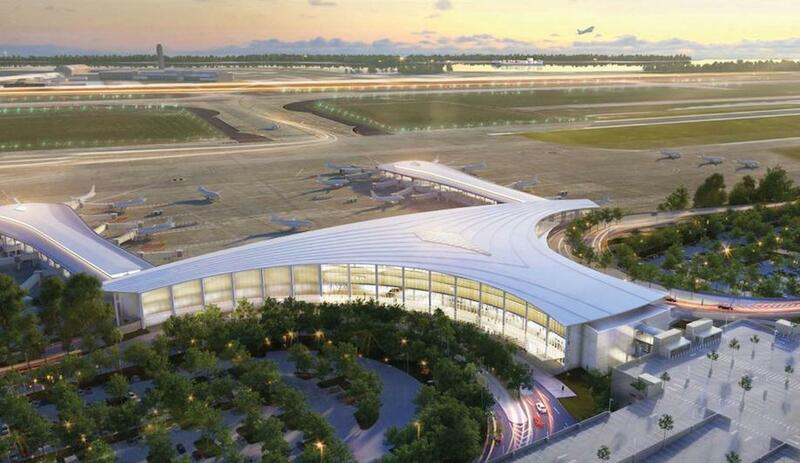 Instead, the contours and curved canopies of Pelli Clarke Pelli’s new airport invoke the twisting Mississippi River. Opening this fall, the airport will be a regional node for the southeastern United States. Comparatively understated to new global aviation hubs, the gentle contours of César Pelli’s design nonetheless hint at moments of quiet architectural wonder.